The NCAA TOURNAMENT was predictably at the top of Saturday’s cable ratings, with TBS scoring 4.89 with the Kentucky vs. Notre Dame game, and 2.63 for Wisconsin vs. Arizona. Nothing else was remotely close, but Nickelodeon’s KIDS CHOICE AWARDS were the next-highest rated original at 0.79. (The network placed 3 other shows in the day’s Top 10 as well, including 0.34 for the THUNDERMANS episode that served as lead-in for the awards show.) HGTV’s HOUSE HUNTERS RENOVATION was up 0.07 to 0.40. PIONEER WOMAN (Food) was up a tenth to 0.39, and KITCHEN AT FN lost 0.04 to 0.25. The season finale of Starz’s BLACK SAILS slid 0.02 to 0.20. 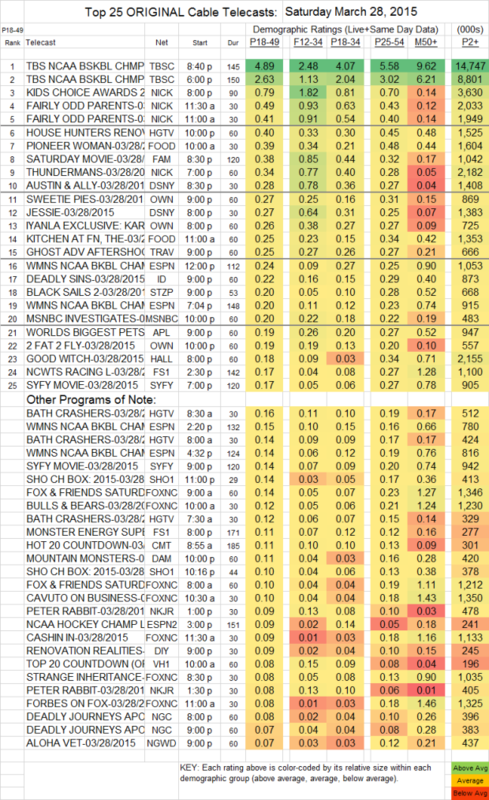 THE GOOD WITCH (Hallmark) gained 0.05 to 0.18.